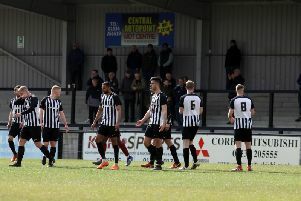 Steve Kinniburgh wants his Corby Town team to “start the way they finished at the weekend” as they get ready for their first home game of the new season tonight (Wednesday). The Steelmen take on Sutton Coldfield Town at Steel Park this evening as they look to build on their 1-1 draw at Cambridge City on the opening day of the Evo-Stik South League Division One Central campaign. A good second-half performance was rewarded with a late Elliot Sandy equaliser after Corby had fallen behind in the opening period. And boss Kinniburgh is now keen to see his team carry on where they left off. “We want to build on a good point we got on Saturday, especially in our first home game of the season,” he said. “We are going to have a lot of Corby supporters here who will be expecting a lot from us. “There is a good atmosphere around the club and that stems from what we have put together on the pitch. “There always has to be a settling in period and we had seven players making their league debuts for the club at the weekend. This evening’s clash sees the Steelmen take on a Sutton Coldfield team who were relegated from Step 3 last season while their first game of the season was against a side who reached the play-off final at this level in the previous campaign. And while Kinniburgh believes the league won’t settle until 10 games have been played, he knows this tough first week will give his team an idea of where they stand as they bid to launch a promotion challenge. “We knew when we saw the fixtures that the first couple of weeks would shape our season,” he added. “The truth is, until 10 games have been played you won’t have any real indication. “But with the game at Cambridge City at the weekend against a club who were in the play-off final last season and then this one against a team who dropped down, we can certainly have an idea of where we are at. Kinniburgh expects to have a full-strength squad to choose from with no injuries being reported following the opening-day draw.